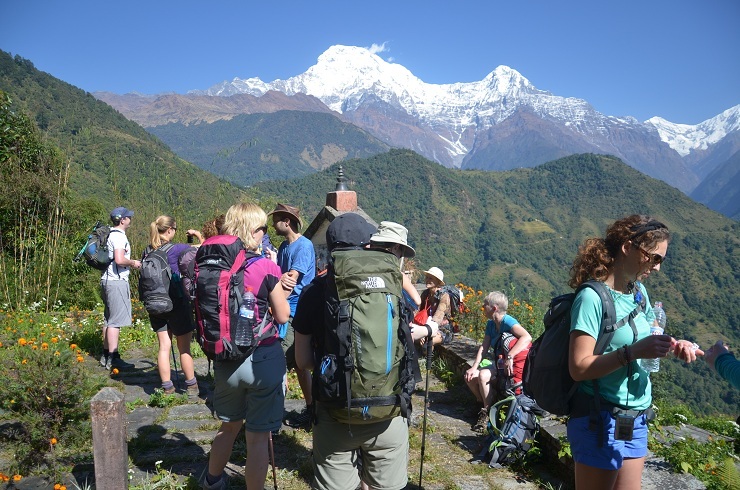 Olivia Seery, who leads Landmark Education’s Self-Expression and Leadership Programme in Ireland, gives the account here of her latest project, a trek through Nepal which raised money for Barnardos, Ireland’s largest children’s charity. Having climbed Mt. Kilimanjaro last year I decided to fund the same charity, Barnardos, this time with a trek in Nepal. I raised the required €5,000 through my own donation, table quiz, leaving buckets at my local supermarket checkout and plan a fun run in my local woods. In addition, a friend will host a complementary therapy evening in a local Sligo hotel. 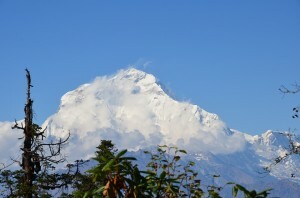 I have safely returned from Nepal 10 days ago. The route chosen was Annapurna which is the most scenic route in the Himalayas and certainly lived up to its name. The group of 16, including Challenge Leader and Doctor, all wearing our Barnardo’s t-shirts and hiking boots (just in case the luggage went missing, the boots were essential!) set off from Dublin Airport on Friday 26th October. It was great for me to meet all these new people and we immediately created excitement and a mutual bond for the adventure ahead. Four flights later we arrived in Pokhara on 28th and finally began our trek from Nayapul experiencing the spectacular views of both the sacred mountain Macchapuchre (Fishtail) and Annapurna South. We ascended and descended many, many steps, estimated 3,500 in one day! We crossed the typical rope bridges. We passed through rhododendron forest, saw tiny villages and hamlets, the fields where rice and millet is grown and, most of all were impressed by the kind and gentle nature of the local people we met. As regards the trek, one of our party said it all when he commented ‘you’d be p****** off if it was easy!’ to which I added my words of wisdom ‘delayed gratification’. We so much enjoyed the camaraderie of sharing rooms in the tea houses, snug in our sleeping bags, early morning breakfast, exercising newly found muscles, climbing deep steps, resting at a holy shrine and finally arriving, sometimes in the dark at our destination for the night. Some stayed up late and their laughter resounded throughout the house and probably even down the valley serving as our lullaby. My room mate Anna showed me her pictures of each day on her ipad so we could relive it all in the comfort of our room. We promised to meet up again, share our photos and perhaps go to some other exotic destination together next year. Between all of us we raised €80,000 and I discovered that this largest Irish Children’s Charity can take care of 2 families for a full year with €5,000.